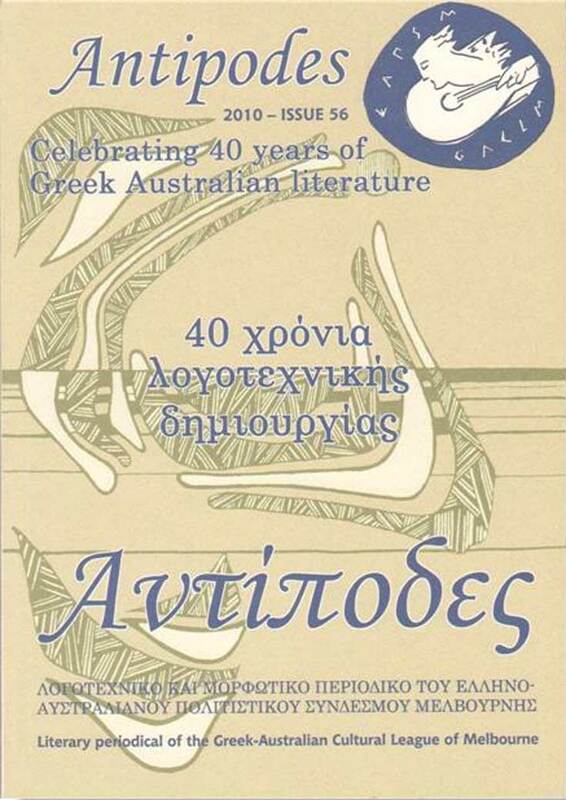 The Greek-Australian Cultural League in order to fulfill its aims and objectives published the “Antipodes” periodical in 1974. This is the longest published, bi-lingual periodical circulating in Australia with 60 printed volumes, counting this year’s publication. Dr Chris Fifis, one of the founding members, gave the name of “Antipodes” thus establishing the geographical location of its inception and place of publication. The periodical has played a major role in the promotion of the flourishing Greek-Australian literature which coincides with its period of circulation. Within its pages a large number of Greek-Australian writers have found their voice and become household names- at least in the Greek circuit. Each year the periodical pays a special tribute to Greek-Australian men/women of letters, those who have helped to maintain and encourage the Greek culture and history, and to artists (visual and performing) who have made a substantial contribution to the Greek community in Australia. With the inclusion of articles, essays, reports, critiques, studies, book reviews and other academic dissertations, the periodical has served and will continue to contribute as an important archival and reference depository for future researches. Another point of note is the recognition that this periodical has received from Greece. Over the years we have had many submissions for the periodical by not only notable Greek writers but also by academics and well known Greek personalities who are familiar with the high standard that the periodical has attained. “The enduring existence of the periodical Antipodes is a credit to the outstanding contributions and the excellent work of the successive editorial committees, and the visionary work of the administrative committees of the GACL,” said Mrs Cathy Alexopoulos, president of the GACL. “Throughout its forty year history the periodical has featured works by Greek-Australian writers and artists in either English or Greek whose contribution to the maintenance of the Greek culture and literature is assured,’ she added.